Miriam Cain of Camper & Nicholsons writes in to say that the price of the 56.1m Tacanuya has had a $5 million price reduction. A joint central agency for sale with Jean-Marie Recamier and Jordan Waugh in the Antibes office, she was built by Swiftships, a well known American commercial yard, in 1992 as a showpice into the luxury yacht market. When bought by her present owner in 1996, the boat was significantly refitted by interior designers Alberto Pinto and Jean Louis Mainguy. Accommodating 15 guests in eight cabins, she has been kept in class to ABS and continually upgraded and improved. 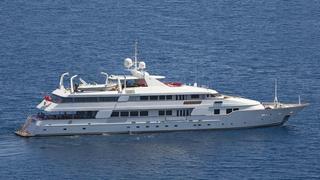 Originally priced at $14.5 million, *Tacanuya *is now asking $9.5 million.